The Hermitage is one of the greatest museums in the world. It is the largest museum in Russia. In the world only the Louvre is larger than the Hermitage. There are 2.6 million objects of art and culture belonging to dif­ferent epochs, countries and nations in the Hermitage. They are exhibited in the five buildings. It was the official residence of Russian emperors. The Winter Palace was built in 1754-1762 by the ar­chitect Bartolomeo Rastrelli. 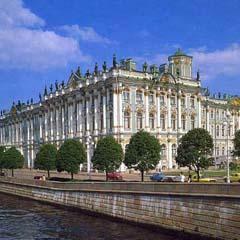 It was the biggest and most elegant building in St. Petersburg in the 18th century. The Small Hermitage was erected in 1767-1769 af­ter the design of the architect Vallin de la Mothe. The building of the Old Hermitage was built in 1775- 1784 by Yuri Felten. The Hermitage Theatre was designed by Giacomo Quarenghi and completed in 1787. The architect built its auditorium in the form of an amphitheatre. There are no boxes, circles, or stalls, and the seats for the audience descend to the stage in wide tiers. The Her­mitage Theatre was the private theatre of Catherine the Great and her descendents. Today this is the lec­ture hall of the Hermitage. The New Hermitage was erected in 1839-1852 after the design of Leo von Klenze by the architects Vasily Stasov and Nicolai Yefimov. The main entrance of the New Hermitage is decorated with ten huge statues of atlantes. They were made from the model of the sculp­tor Alexander Terelenev. The word Hermitage means “the dwelling of a her­mit”. This name dates back to the 18th century when Catherine II was the empress of Russia. The story of the Hermitage collection began with Catherine II. 225 Dutch and Flemish paintings were bought in Berlin for the Winter Palace in 1764. Only a few of the empress’s courtiers were allowed to see her collec­tion. It was only in 1852 when members of the elite were admitted to the museum on special invitation cards. There was a fire in the palace on the 17th of December in 1873. The fire burnt for three days. It destroyed everything but the brick walls. The sol­diers managed to take away all the pictures from the palace. They were piled in the square near Alexander Column. The passages leading to the Small Hermit­age were heaped with bricks and thus the fire was stopped. The restoration was done by the architects V. Starov and A. Bryullov. At present the Hermitage collections include not only pictures, drawings, engravings, sculptures, but items of decorative and applied art as well. Now the Hermitage is open to all people. The Her­mitage frequently displays its collections abroad and arranges foreign exhibitions in St. Petersburg.